The plan, if you could call it that, had been for me to hitchhike out to California and then up to Oregon. It certainly did not include barreling through Riverside, Wyoming late at night while riding shotgun for an enraged cowboy with a death wish. I was eighteen years old. It was the summer of 1970, shortly after my graduation from high school in Dobbs Ferry, a small town up the Hudson River from Manhattan. This may be hard for younger generations to visualize, but hitchhikers used to dot the roads of this country—sometimes with destination signs; usually with just thumbs; or, when I hitched around Boston with my college friend Portnoy, improvising comical routines to entice drivers. The best magnet was an attractive girl—with the guy, of course, out of plain view. Hitchhiking short distances with a friend on the east coast was fun, cheap, and relatively easy. But hitching out West in 1970, I had no magnet: I went alone with a backpack, a sleeping bag, and several hundred dollars I’d earned working in a butcher shop after school and on weekends. I had no credit card and the closest thing to a cell phone any of us had seen in those days was Maxwell Smart’s shoe phone. Although I’ve told the story I’m about to relate countless times over the years, it wasn’t until writing this piece that I paused to consider the obvious questions I should have asked myself back in 1970: Why was I doing this? And why were my parents allowing their kid to do it? For my part, I probably just fantasized that it would be a neat and impressive feat, with no idea of what the trip would actually entail—including the obvious safety risks. Why my parents let me go is beyond me, even more so today as the father of 18 year old boys. Granted, although devoted and caring, my parents were permissive. The only prohibited activities I remember were riding motorcycles and playing on the Dobbs Ferry High school football team—understandable given that my dad was in the insurance business and Dobbs Ferry was building the longest losing streak in New York state history. I believe we lost every game for six years—a trend reversed years later when my classmate Jim Lindsay took over the coaching and brought us glory as a small-town football powerhouse. In any event, I don’t recall my parents trying to forbid or even talk me out of hitching out west. I travelled as far as Denver with someone I knew, and then hitched alone through the West. Until a few weeks ago, I would have sworn my partner from Dobbs Ferry to Denver was Court Patterson– a friend in the class behind me who came from one of the few non-Jewish families in our enclave of what were anomalously referred to as “garden apartments.” But in a recent email, Court told me that we had never hitchhiked together. He reminisced that the two of us had spent an earlier summer trying to sell Fuller Brushes door-to-door and playing whiffle ball most afternoons after we’d given up. But my clear recollection of traveling with Court to Denver was pure fantasy. I don’t know how or with whom I got from New York to Denver. My only memory of that leg of the trip is an overnight stay in Lincoln, Nebraska with people I didn’t know in an apartment overlooking what seemed like a busy downtown street. I remember that night only because someone there had a pound of marijuana and I had visions of getting busted and spending years behind bars in Nebraska. From Denver—now on my own—I got off to a rocky start. Heading north to Boulder I was stopped by police as I stood, thumb-out, on the side of a highway on which hitching was prohibited. I don’t remember what they did to me—so it couldn’t have been much—but I somehow wound up back in Denver and had to start out again. I got to Boulder eventually and spent a few days wandering around Rocky Mountain National Park and sleeping nearby in an octagonal hut without a door. The place had been abandoned by its builder, who had left a kind welcome message for strangers like me. My next rides took me north to Cheyenne, Wyoming. Looking at Google Maps today, I see that the route from Boulder to Cheyenne intersects Interstate 80, which would have taken me directly west to California. But not in a hurry, I continued on to Cheyenne, hoping to make my way to Yellowstone National Park in northwestern Wyoming. I rode into Cheyenne in the back of a pick-up truck, courtesy of a lively bunch of Chicanos. There were three up front in the cab of the truck and four or five with me in the back, sitting against the side panels and talking to one another nonstop in Spanish. I didn’t understand a word of it, but they took me in with smiles, gestures, and a few words of English here and there. This was the joy of hitchhiking: the thrill of luring a ride with strangers; running, pack-laden, to catch-up to where they’d pulled-over; and climbing in to meet and make new, albeit fleeting, friends—none of whom looked or sounded like a college-bound Jewish kid from New York. Although he came across as fairly reserved, it soon became clear that the cowboy wanted someone to talk to that afternoon. He spoke slowly, with a mild drawl, including about a former girlfriend he planned to get back together with. I told him I was from a small town in New York and talked about my job at the Elmsford butcher shop, which sold customers whole sides of beef—figuring that would be more impressive than my impending enrollment at Tufts University. Hearing that I was headed for Yellowstone, he asked “How’d you like to take the scenic route?” And, with nowhere I needed to be that night, I was game. The cowboy had a case of beer between us on the front seat. Downing one can after another as we rode along through Medicine Bow National Forest, which was indeed scenic, he tossed the empties out the window. Although never lacking for vices, I wasn’t much of a beer drinker and could never understand how friends at home could down six packs when we snuck onto the golf course of the exclusive Ardsley country club on weekend nights (“exclusive,” meaning this was the only way a Jew could gain admittance). In any event, I couldn’t keep up with the cowboy, and with each succeeding round the cans flying out my own window were increasingly full. I don’t remember if we’d run out of beer when we made our first stop—a one-room bar in the middle of nowhere. There were several empty tables, an unused shuffle board game, a jukebox, and a few guys at the bar who looked a lot like the cowboy. But what struck me as I looked around while my partner grabbed our beers were the dollar bills, fives, and other paper money tacked up all over the dark, rough-hewn wooden walls. The cowboy explained that this was “hard luck” money: regulars initialed the bills and put them up when they had a few extra bucks so they could come back and use them when they didn’t. Back on the road and by then in a fog, I had no idea where we were going until we pulled into Riverside at around 9 pm. Other than our next brief stop—a bar with a few parked cars outside—there didn’t seem to be any activity in town. I said I’d wait in the truck as the cowboy went in for a night cap. It wasn’t until after he emerged about a half-hour later that I realized why we’d taken the “scenic route” in the wrong direction from Yellowstone. The cowboy backed out quickly, drove for less than a minute, turned left onto a small street, and pulled over in front of a small house with a driveway in which two cars were parked. He seemed grim as he told me he needed to stop in to see a friend, who I gathered was the former girlfriend I’d heard about. He wasn’t in there long. She apparently had thrown him out at least once before and proceeded to do so, in short order, again. Now plainly drunk, the cowboy got back in the truck, peeled-out and, accelerating wildly, growled in a somber and determined voice: “I’m lookin for death.” With an air of authority that I hoped would mask my panic, I told him I was getting out. I was almost as surprised as I was relieved when he pulled over. Having escaped my first deathtrap, I was spending the night in Riverside, Wyoming, population 87, sleeping alone on the bank of the small river that ran under the highway, and from which the town got its name. I don’t remember now being upset or afraid once I was free of the cowboy, although it must have been one of those moments when I asked myself what I’d been thinking when I’d set off on this lark—and whether I should just phone home and call the whole thing off. Waking the next morning, I jammed my sleeping bag into its stuff sack, hoisted my pack, and walked up the bank to the highway to resume my journey to Yellowstone. But there was no traffic. None. After waiting on the roadside for what seemed like a few hours, a large flatbed truck came my way. In desperation, I forgot about my thumb and flagged-down the truck with both arms. When I caught up to where he’d stopped, the driver told me to climb onto the back of the fully-loaded open truck bed. I rode out of Riverside sitting atop a cargo of railroad ties (probably creosote-coated) at what seemed to me like 75 miles an hour. It was a beautiful summer day and the ride was thrilling. One of those hitchhiking “highs” that makes you forget all about the lows that came before. I don’t know how far the flatbed took me, but it wasn’t to Yellowstone because I never got there. I stood on a road within miles of the park watching an endless parade of Winnebago’s and station wagons carrying families that looked like mine pass me by. I decided that Yellowstone wasn’t so important after all and, after a few futile hours, crossed the road and headed west for California. There were other “highlights” along the way west through Idaho and Nevada to California and then up the coast to Oregon: my first time in a casino—a seedy, depressing scene in Reno in the middle of the night. A long ride up the coast of northern California in a young couple’s Volkswagen van sitting beside a huge German Shepard named “Compadre.” Already petrified of shepherds, it didn’t help that Compadre made clear that he didn’t recognize me whenever I got back in the van after one of our stops. We spent one night in a mostly glass house in the woods of Mendocino visiting the woman’s mother. The mom was living with a man younger than her daughter and a curious collection of friendly characters, most of whom seemed to be recovering from, or enjoying, some drug episode or other. Hearing that I’d worked in the butcher shop, they led me to the remains of a deer hanging in a shed from a meat hook. Given the sorry state of the carcass, it was apparent that even as a rank amateur, I knew more about how to cut meat than anyone else there. And so, although their knives were dull and the result wasn’t pretty, I gave it my best shot. Back on the road the next morning, Compadre was his old terrifying self for the first several minutes until we got reacquainted. These memorable episodes were oases in the midst of long, luckless stretches standing on roadsides and, more generally, a lot of time alone, often pondering whether to make one of my periodic collect calls home so I could hear my parents’ voices and bravely tell them everything was great. The trip was an ever-changing jumble of exhilaration, fun with new friends, loneliness, fear, and self-doubt—like strong tides constantly and unpredictably changing direction. Writing this piece, I’ve contemplated for the first time whether the risks, anxiety, and loneliness were worth it. And as I think back and strain to reconstruct my memory of the events—and what I was feeling at the time—the answer is yes. Why? Because of the thrills of snaring a ride; the cowboys, Chicanos, and other friendly souls from outside my small world who I otherwise never would have met; and the places like Riverside I never would have seen. And because going it alone intensified all the highs, which instantly washed away the temporary loneliness and anxiety. Hitchhiking “across America” has become one of the highlights of my otherwise modest autobiography—and a reservoir of stories, some embellished, with which to regale old and new friends. And I must have thought it was all worth the trouble because three years later I put the same beat-up JanSport pack on my back and set off by myself across Europe. Today, Millennials are leaving cocoons in search of adventures. But they’re not hitchhiking and, for that matter, virtually no one is. I’m not sure when Americans stopped hitching, and wonder what, if anything, its extinction reflects about how we raise our kids these days and how they will learn to handle danger and adversity. In this age of the internet, cell-phones, Google Maps and helicopter parents, even if my 20 year old son were to set off on an odyssey like mine, we’d know where he was every minute of the day and night. We’d track his progress online, get constant texts and photos, and be ready to swoop in to rescue him if his credit card and our real-time advice couldn’t bail him out. But there’s no point cogitating about his journey, because we’d never let him hitchhike across the country in the first place—and he wouldn’t give a moment’s thought to taking such a trip alone, without an itinerary, wasting days trying to lure rides only to get to a remote place like Riverside with nothing to commend itself other than that’s where he landed—courtesy of strangers who picked him up for all sorts of reasons. What’s more, even if he did venture forth, who would pick him up? I doubt I’d stop for a hitchhiker these days—although I’d feel guilty and a little sad passing him by. Finally, what about the actual dangers of hitchhiking in today’s world—the risk of being picked up by some pervert or other criminal? 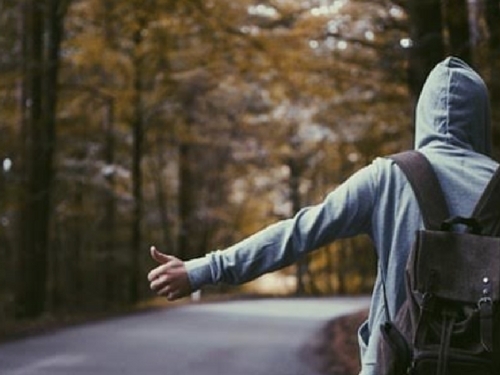 We don’t trust in and enjoy the goodness of strangers, the essential pre-requisite to hitchhiking. Given the extreme polarization plaguing our country, my Wyoming cowboy probably wouldn’t stop to pick up a long-haired kid who looked like me. We continue guiding, protecting and supporting our kids well into adulthood—shielding them from all kinds of failures, risks, dangers and discomforts. This may be excessive, but it’s not all bad. In no small part as a result, many of us remain closely bonded with our kids in loving relationships. So, this is not a call to send our kids out on the roads of America alone using their thumbs to get to destinations unknown. And I marvel at Google and my iPhone, which I can’t do without. But I am sorry that so many of our kids, mine included, have not gotten to experience the kinds of adventures I did; that they haven’t met the Chicanos, Indians and Wyoming cowboys who picked me up; and that they haven’t had to spend a night on the side of a road in a Riverside or known the thrill of riding out of town on the back of a flatbed truck. Because all in all, it was a good way to see America and grow a bit. Just finished this and enjoyed it immensely. I do remember the hitchhiking trend and briefly participated in it but only to upstate Woodstockian venues , usually as “the girl” and never alone. The cross country trip was something many of our generation dreamed of doing and some but certainly not all, actually did. My husband did a partial version from Chicago to the West Coast with friends from Brown one summer. It seemed a right of passage then and I’ve always envied him for having done it. But no one that I can remember did what you did, which was to brave it out on one’s own. The story is wonderful and captures so well the period we grew up in and the adventure you embarked on that summer. It’s particularly fun reading for someone who was in your class and grew up with you to graduate from DFHS in 1970, but I don’t think those qualifications are required for a reader to really enjoy the tale. Keep up the posts. You’re an excellent writer. I look forward to reading some more.